High quality requirements are the basis for the development of value-adding solutions. objectiF RM supports you in developing comprehensible, clearly structured requirements. High-quality requirements are the foundation for developing valuable solutions. objectiF RM supports you in developing traceable, clearly-structured requirements. To analyze requirements from different sources, you need a selection of recommended mediums. You can find them in objectiF RM. By the way, however and in whichever context you create a requirement, all the relevant information will be saved in objectiF RM’s real-time repository without redundancy. 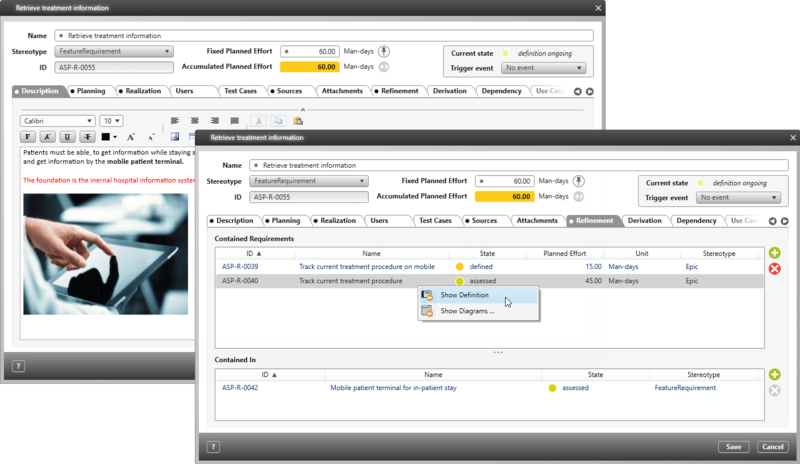 Requirements – like all other artifacts of requirements engineering – are recorded in objectiF RM in a form. That way you make sure that all the requirements have the same structure. Trigger events that lead to a state change for requirements and, if necessary, initiate notifications and actions in a workflow. Doesn’t the requirement form correspond to your needs? Does it contain too much or too little information? No problem. In objectiF RM you can expand existing forms with properties or replace them completely with your own forms. Which requirements, use cases and system components are affected if a stakeholder changes a goal or a requirement? objectiF RM provides the answers to these questions in lists and with direct navigation between dependent artifacts. The requirement form shows all information available information about a requirement in the objectiF RM real-time repository, no matter whether they come from direct entry or modeling. 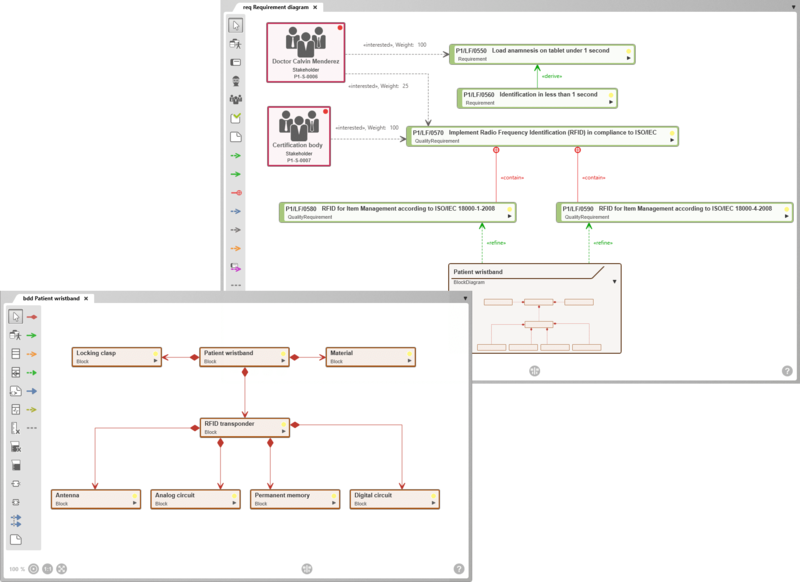 With objectiF RM you can display relationships between requirements and many other requirement engineering documents in diagrams. objectiF RM provides UML or SysML diagrams and other means for this. These graphic mediums facilitate communication in teams and with stakeholders when analyzing requirements. By sketching relationships between elements in diagrams, you can leave “traces” and define paths for navigating between artifacts. Each relationship is a navigation path for traceability, whether or not it is modelled in a diagram or specified in a form. 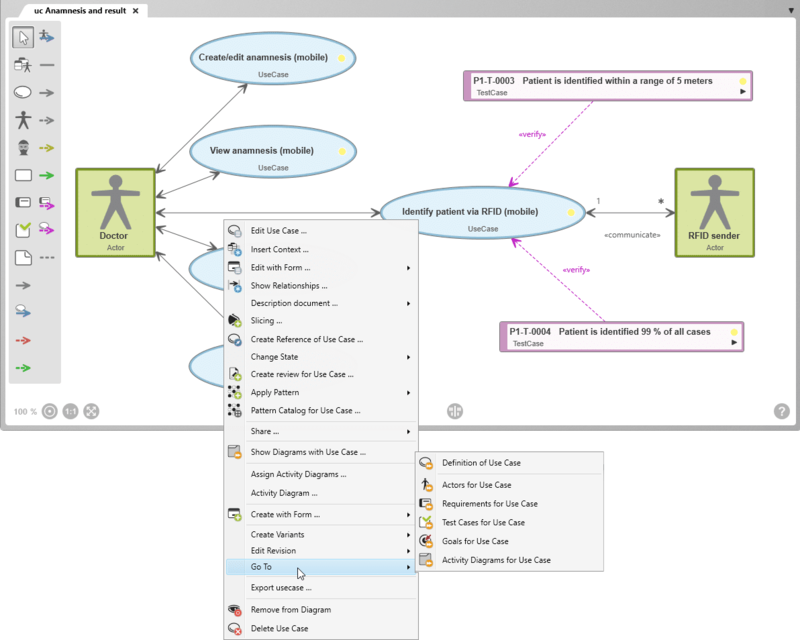 Relationships allow context-orientated navigation, like here in the example of the use case diagram. The answer to questions like “which requirements are derived from a use case?” “Which stakeholder goals are fulfilled by this use case?” and “are there test cases for this use case?” are just a mouse click away. If you are going into uncharted territory with a project, it makes sense to ensure that the requirements can be realized at an early point in the project. That means decisions about the foundational architecture must be made. It can help to detail requirements parallel to the system architecture, so to form requirements and then specific the system architecture at a high level. Then let the knowledge gained in the refinement of requirements flow in, further refine the requirements and architecture and so on. objectiF RM provides class and package diagrams as well as block definition diagrams and internal block diagrams for system architecture refinement. 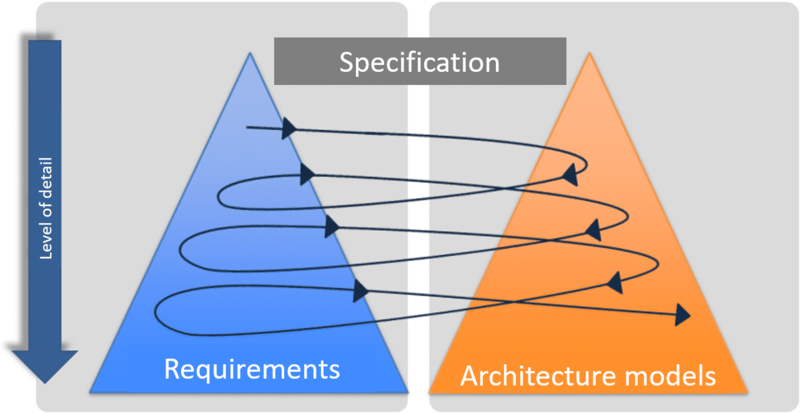 Parallel refinement of requirements and system architecture can be expressed in models: block diagrams that can describe architecture aspects, be referenced in requirements diagrams and are connected with requirements though «refine» relationships. Refinement of the system architecture and requirements at the same time.